Everything you need to know about Upper Highway Air. Is UHA an official organisation? Although we started out as an informal group of concerned residents, we have formed a formal section 21 Non profit company and have applied for our Non profit certification with the Department of Social Development. Is EnviroServ trading now that the Minister conditionally lifted the suspension? No, our interim relief still stands halting them from trading. This will stand until the hearing takes place and only if the order is discharged can they trade. Is the landfill still allowed to accept hazardous waste? The DEA issued a compliance notice in October prohibiting the dumping of type 1 waste but on the 4th April 2017, the DEA issued a directive to EnviroServ to cease all acceptance, treatment & disposal of all waste streams at the EnviroServ Shongweni landfill. EnviroServ has appealed this directive which suspends this directive. UHA applied to the courts for an interdict to enforce the DEA’s s56 notice and were granted interim relief which has now interdicted EnviroServ from acceptance, treatment & disposal of all waste streams as well as to remove leachate and contaminated storm water from the site. Where can I find more information on waste management policy, permits & hazardous waste? Awareness through the means of educating our community is a key tool to resolving our current situation. Below are a few policies, National Acts that may enlighten residents as to the foundation levels of waste management in South Africa. We encourage you to research and find as much information as possible! Does UHA have legal representation? Yes, we are represented by Charmane Nel of McGregor Erasmus Attorneys. Their website is www.meattorneys.co.za. How can I submit an Interested and Affected Party (IAP) for the litigation? Those interested and affected members of the community who are prepared to formally record in the litigation to be instituted by Upper Highway Air against, amongst others, the DEA and Department of Water & Sanitation, that we are litigating in protection of their human rights and in their interests, are required to formally email admin@upperhighwayair.co.za with subject “IAP – FULL NAME” (example: IAP – JANE DOE) with their full names, address, identity number and a short description of their nuisance, odour and /or health impacts suffered, the period over which it has been suffered, and confirmation that they are prepared to be named as interested and affected parties in a schedule to be attached to the court papers. You will not, in fact be cited as a party to the litigation but will be named in a schedule as parties who support the litigation instituted by the NGO in protection of your interests and human rights. How can I submit a Human Rights complaint? A Human Rights form is available here. And can be sent to tmagwenyane@sahrc.org.za . Remember that the human right violated is the right to clean air. Please verify that you receive a reference number for your complaint. Why do I need to report via the website and apps? Complaints logged via the website & apps are sent directly to EnviroServ, Ethekwini Municipality Health Department and Air Pollution divisions, the Department of Environmental Affairs and to us at Upper Highway Air. This is to keep track of all the complaints logged and to make sure that all the relevant parties receive your submission. Logging a complaint is vital, if you do not complain, it is deemed that you do not have a problem, and therefore nothing will be done to rectify it. Complaints data from the website is also analysed and collated with the findings gathered by our independent experts. Who can I contact if I have important information to disclose? UHA are open to community feedback as well as any information you may have that could help us to regain our healthy, fresh air! Please contact us HERE. We regard your privacy with paramount importance and will not disclose any information shared. Want to remain anonymous? Use our Tips Submission Form on the contact page. Can I withhold payment of my Municipal rates & taxes due to the pollution? No. Rates, like all taxes cannot be withheld as a form of protest. The fiscus has legislated pay now fight later laws, even if it were taxes that you were disputing, let alone other municipal issues. Has Carte Blanche been contacted? We have met with their content writer and producer. We will continue to provide information to them including the results of the scientific studies when they become available. Please don’t worry to contact them directly as we are in direct contact with the producer. Why has the air pollution in our area not been resolved & what are UHA doing about it? Many questions have been asked over several months with regards to this matter. UHA have followed procedural guidelines by the book and taken the necessary steps in informing all the authorities necessary with regards to the situation we are faced with. Together with the websites & apps log of complaints and affidavits submitted, the Department of Environmental Affairs took note of the case and the Green Scorpions have been tasked in investigating this matter. EnviroServ have admitted to contributing to the odour experienced in the region, but have not excluded themselves as the sole source. An investigation done by the Health Department cleared the majority of large agricultural businesses in the area, the waste water treatment works, as well as the Transnet pipeline. We have also been in contact with the South African Human Rights Commission on the subject as well as various other organisations. From the very beginning we sought out the guidance of Desmond D’sa of SDCEA and Bobby Peak of groundWork, who have on several occasions dealt with similar instances of what we have been experiencing in the Upper Highway areas. We have gained a lot of momentum and at this point are not relying solely on Government authorities to resolve the problem. We are working with our own independent air quality consultants and experts from their relevant fields. We are in the process of gathering formal IAP’s for the purpose of litigation, please read the post here. For further information please read through our Blog and Press pages. What has been found in the air so far? Our SANAS accredited testing has shown H2S and Hydrocarbons present in the air. Why does it still smell after our interim relief was granted? The smell is landfill gas which is always at the landfill. Gas will take the path of least resistance to leave the landfill. Whilst acceptance, treatment and disposal has ceased, this does not address the issue of the gas. The gas will be there until engineered active gas extraction is implimented at the site. Why are we still seeing trucks coming and going from the site? Whilst acceptance, treatment and disposal has stopped, all other landfill operations are still in place. The landfill is not ‘closed’. Remedial measures like the addition of lime to the waste face is still ongoing as well as tankering off the leachate from the site to alternate licensed facilities like Holfontein. Why is the smell worse at night? At night, the land surface cools quickly after sunset. As a result, the air in contact with the land surface becomes cooler than the air above it. This is particularly relevant on calm, cold (e.g. winter) nights, and is very noticeable in a valley environment, when cold air along the valley slopes subsides into the valley, displacing any warm air. When warmer air overlies cooler air in the atmosphere, we say that an atmospheric inversion exists. 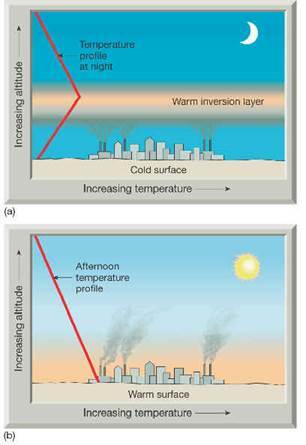 Atmospheric inversions result in a stable atmosphere, which limits the vertical dispersion of pollutants. An inversion acts like a lid on a pot, trapping the pollutants near the surface. As a result, concentrations increase near the surface and if these pollutants are odorous, odours increase too. In the morning, with sunrise, the ground surface heats up quickly. The air in contact with the surface will warm up and the inversion will erode from the surface upwards, until an unstable, more turbulent atmosphere exists with greater vertical dispersion of pollutants away from the surface. Pollutant concentrations will decrease near the surface, and any odours will be alleviated. Why is the smell worse when it is overcast and rainy? As atmospheric pressure drops, with the approach of a cold front or the development of a storm, emissions from a landfill increase, through a process known as ‘barometric pumping’. There is a flow of gases from higher to lower pressure and as atmospheric pressure drops, the pressure differential between the landfill gas and the atmosphere increases, enhancing the flow from the landfill. After the rain system passes, and atmospheric pressure begins to rise, emissions from a landfill will decrease as the pressure differential decreases. Many people love the smell of the air after rain. This is in fact not the smell of the rain itself, but rather the earthy smell of aerosols leaving the soil surface as rain drops percolate the soil and displace these compounds at the surface. This process is enhanced under light rains, as there is a gentle percolation, rather than a hardening of the surface under heavy rain and greater runoff. At the landfill surface, a similar process occurs under light rains, with the displacement of odorous landfill gases into the air. Instead of the lovely earthy smell associated with the rain, however, there is exposure to odorous gases. Other factors to consider include increased bacterial decomposition and chemical reactions at the landfill surface with the addition of moisture, and any overland flow off the landfill that can transfer odours offsite. Does the Shongweni River flow into the Shongweni Dam? No, the Shongweni river does not flow into the Shongweni dam. Its the Mlazi River that does. Great! we’d love to have you on board! Fill out our form and let us know your best qualities and skills, we need as many good people to help as possible. We are currently looking for individuals to help on our awareness campaign. Click here for more information on how to donate. Where do the proceeds of my donations go? Proceeds received by UHA are used to pay for ongoing independent SANAS accredited air, water and soil sampling as well as further consulting with experts in their respective fields, proceeds are also used to fund awareness campaigns, the ongoing disbursements and day to day runnings of the NPC, court and sherriff fees, meetings etc. Yes, we are able to issue s18a certificates to those who require them. Please send your proof of payment to admin@upperhighwayair.co.za and a certificate will be issued to the name on the deposit slip. Yes, our auditors are Ernst & Young. Where has the money been spent so far? We have purchased 3 new weather stations for accurate reporting, these are up in Winston Park, Plantations and Summerveld. The SANAS accredited air, water and soil testing to be used in court as well as independent expert witnesses in their relevant fields. Flights for the NPC to represent the community in Pretoria for the s56 notice representations. We have also purchased a credit card machine to assist with sales of our merchandise. The Toxic Trek cost us money with hiring of porter loo’s, getting the required insurance in place and hiring of the DJ and music. We did however, make this money back in the sales of shirts and other merchandise. Plus, the exposure from this was incredible. How can we view the financials? If you would like a copy of the audited financials, please send an email request to admin@upperhighwayair.co.za and these will be made available to you.